19 Abercromby Square, photograph by Chris Williams, Liverpool, England, 2015. Charles K. Prioleau, businessman and supporter of the Confederacy, resided at 19 Abercromby from 1862-1870. 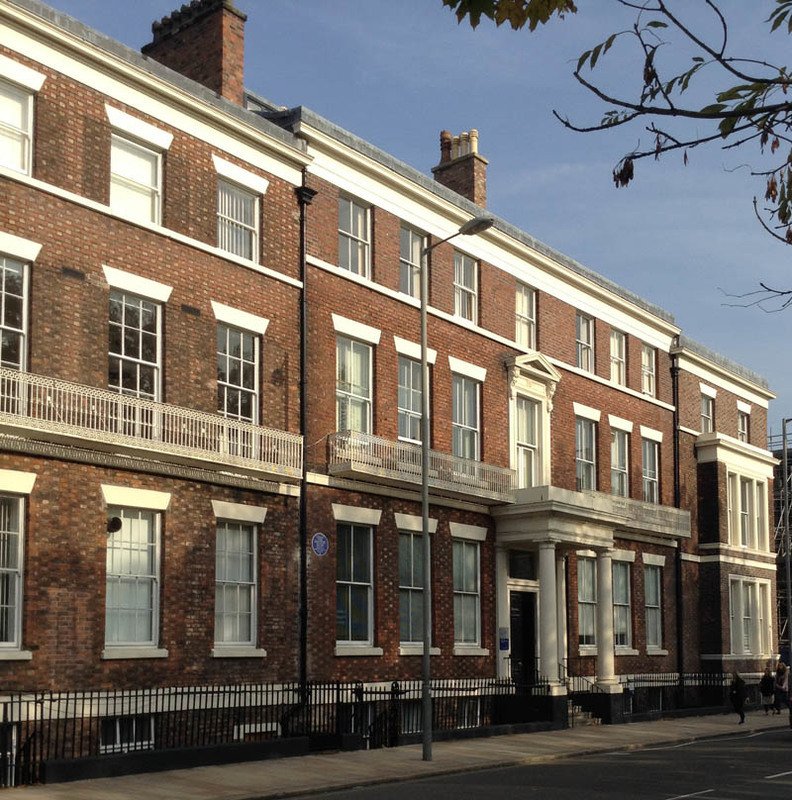 Among the many influential residences in this elite neighborhood, the history of 19 Abercromby Square serves as a striking example of the powerful ties between Liverpool and the Confederacy. Charles Prioleau first constructed this Georgian-style house in 1862, and some evidence suggests that members of the Southern Club originally intended this building to be an unofficial embassy in Liverpool for the Confederacy, providing a base for business and diplomacy. Although there is no direct proof of this claim, according to a contemporary newspaper account, Number 19 was specifically designed to be a European "White House" for the Confederate President Jefferson Davis. Because he often worked in secret, Prioleau is not a well-known name in general histories of the Civil War, but his business operations in Liverpool made him one of the most influential supporters of the Confederacy in Britain. Painting of Palmetto tree on the ceiling of the entrance to 19 Abercromby Square, photograph by Chris Williams, Liverpool, England, 2015. 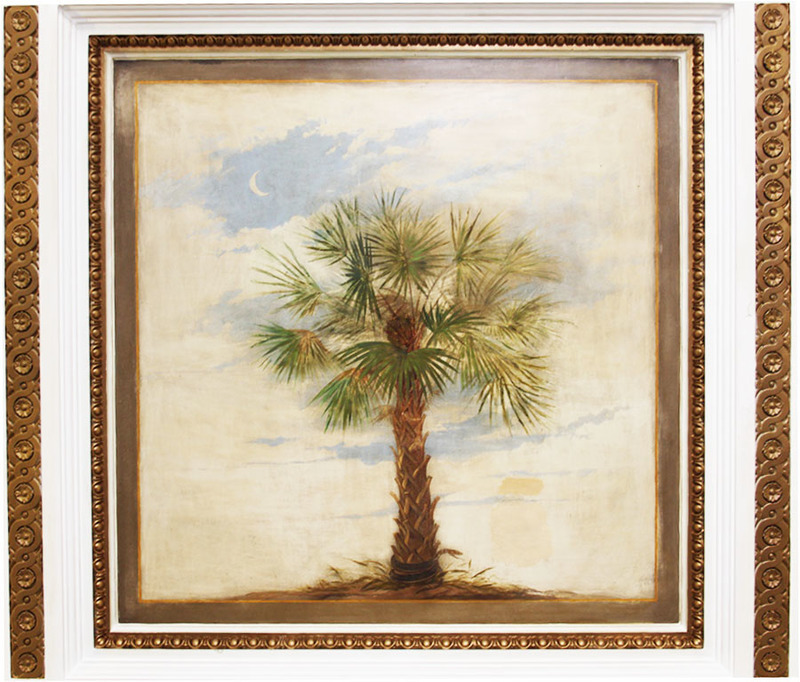 The palmetto tree is the official state tree of South Carolina, which is often referred to as "The Palmetto State." Prioleau came from an influential French Huguenot family in Charleston, South Carolina. In 1850, he married the daughter of Richard Wright, a Liverpool shipowner. Around 1855, he moved from Charleston to England and established himself in Liverpool's business and social community, developing personal and business trade links between South Carolina and England. Prioleau became a naturalized British citizen at the outbreak of the Civil War, which was a strategic move both politically and financially. As a citizen, Prioleau became the only British partner and representative of Fraser, Trenholm, & Co—the unofficial bankers of the Confederate cause in Great Britain. With a British registered company and a British citizen as director, Fraser, Trenholm, & Co. could operate a legitimate British business during the war, even though the senior partner of the company, George Trenholm, was based in Charleston. During the war, Trenholm was in constant communication with Prioleau across the Atlantic. A southern politician as well as businessman, Trenholm also became the Secretary of the Treasury during the final year of Jefferson Davis’s Confederate government. As a fervent supporter of the Confederate cause, Prioleau facilitated financial transactions in Britain, and directly and indirectly helped to organize arms and supplies to the Confederacy. In 1861, he presented a Whitworth cannon on a rosewood carriage to the state of South Carolina. It was conveyed to Cummings Point in Charleston Harbor, and is said to have fired the first twelve-pound round in the bombardment of Fort Sumter. The cannon was manufactured by Robert Preston’s foundry in Liverpool. In the same year, Confederate Captain Caleb Huse tried to arrange a $195,000 deal for 10,000 Enfield rifles. Unable to complete the purchase himself, he noted in his memoirs that Charles Prioleau has “most generously assumed the responsibility of the entire contract." Prioleau also offered the Confederate government cargo space on one of his ships, the Bermuda, as it completed the first run against the Union blockade in September 1861. 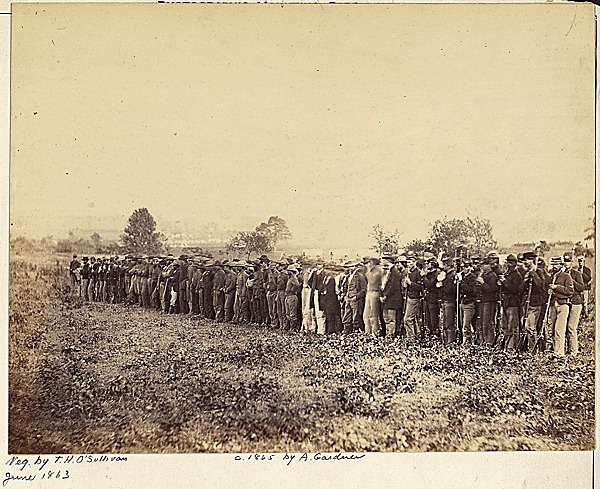 Confederate prisoners at Fairfax Court House, photograph by Timothy H. O' Sullivan, Fairfax, Virginia, 1863, courtesy of the National Archives and Records Administration. In 1864, Abercromby Square resident Charles Prioleau organized a fundraiser called the Southern Bazaar to aid Confederate prisoners of war. He also served as the treasurer for the Committee for the Relief of Southern Prisoners in Great Britain. Fraser, Trenholm, & Co, as well as Prioleau in a private capacity, funded purchases of arms and the building of blockade runners for the Confederacy throughout the war. In addition, Prioleau was the treasurer for the Committee for the Relief of Southern Prisoners, which distributed five thousand flannel shirts, two thousands blankets, ten thousand wool socks, and five thousand flannel drawers to Confederate prisoners. He also sent tens of thousands of Bibles free of charge for Confederate soldiers in the field. At times, Prioleau would forego personal profit in the interests of a southern victory, but he was also an astute and successful businessman. In addition to his profits from Fraser, Trenholm, & Co, in one nine-month period in 1863, his personal business dealings in cotton yielded a profit equivalent to over 500,000 U.S. dollars today. While making huge profits, he also advised his partners in South Carolina on successful and profitable strategies for blockade running. Had the Confederate forces listened to Prioleau's advice, the Confederate army and navy may have been able to continue their resistance for significantly longer.